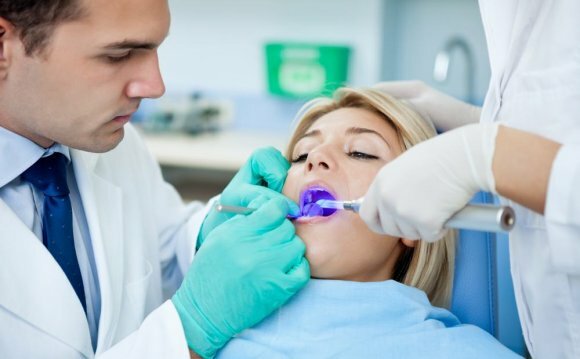 The last decade has witnessed an explosion in the number of teeth whitening kits and systems that have become available on an over-the-counter basis. The most effective of these products are the "peroxide-based" teeth whiteners. At home teeth whitening using peroxides initially gained widespread acceptance among dentists after a bleaching tray technique using a 10% carbamide peroxide whitening gel was described in a clinical study published in 1989. Since then a number of over-the-counter teeth whitening products have been brought to market. Many of these products have simply tried to emulate the original dentist dispensed and supervised version of this technique. Others have sought market share by introducing variation and innovation to the methodology of at-home peroxide-based teeth whitening. Our pages discuss and review four over-the-counter peroxide-based at-home teeth whitening systems, they are: bleaching with whitening strips, teeth whitening using bleaching trays and carbamide peroxide teeth whitener, paint-on teeth whitening, and whitening toothpastes. Each of these systems has its own unique set of characteristics and as a result each has its own strengths, weaknesses, and best uses. This was the first type of at-home peroxide-based teeth whitening to become popular on a wide spread basis. It involves placing a whitening gel in plastic tray that is then seated over the user's teeth. More research articles and clinical studies have involved the evaluation of tray teeth whitening (using 10% carbamide peroxide as the bleaching gel) than any other type of at-home teeth whitening system. Crest ® introduced whitening strip methodology to the over-the-counter marketplace with the debut of their Whitestrips ® product. Their apparent goal seems to have been to create a "trayless" bleaching technique that is capable of competing with the effectiveness of tray-based teeth whitening. Crest Whitestrips is a registered trademark of Proctor & Gamble Company. As their name implies, paint-on teeth whiteners don't make use of bleaching trays but instead are painted directly on to the tooth's surface. Toothpaste manufacturers have touted whitening claims for years. A recent development in the field of whitening toothpastes is to include a peroxide in their formulation. Send this page to a friend. Bookmark / social bookmark this page. About the of our pages. What Can whitening your teeth Fast?